Willi Forrer on "the good old days"
A visit to Kitzbühel means a trip down memory lane for Willi Forrer. The Swiss man will watch the 76th Hahnenkamm Races together with his daughter, Brigitte Forrer, from the side-lines. The former ski racer does not normally travel to the races anymore, but „Kitzbühel is always a special experience“. A time of meeting old friends and talking about the good old days, when there were no grooming machines, crash helmets or safety nets. „Even so, we hurtled down the Hausberg at speeds of 110 to 120 km/h“, recalls Forrer, who regularly competed at the Hahnenkamm Races from 1957 to 1962. He still regards the Streif as a test of courage. 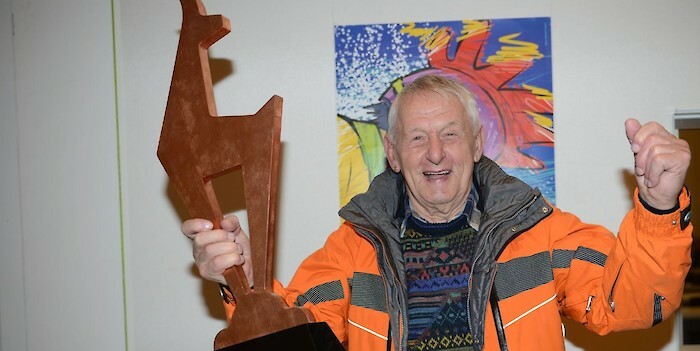 „Furthermore, we only had ourselves to reply on, there was no team Support and we never received any prize money.“ The Hahnenkamm Downhill winner of 1962 was delighted to have a "Gams" trophy in his hands again for this photo. „I have a "Gams" at home too, although the trophies were much smaller back then and mounted on a marble base. Winners also received a leather suitcase“. Together with his daughter, the man from Toggenburg in Switzerland will be following the second Downhill Training run from the vantage point offered by the Mausefalle. „We don't have our skis with us, though“, says Willi Forrer. These two visitors from Switzerland will watch the Combined Event from the comfort of the grandstand in the finishing Stadium tomorrow, Friday.